Oobleck is a suspension of cornstarch and water that can behave like a solid or a liquid depending on how much pressure you apply. Try to grab some in your hand and it will form a solid ball in your palm just until you release the pressure, then it will flow out between your fingers. Materials that behave this way are classified as non-Newtonian liquids because their flow properties are not described by a constant viscosity. The name Oobleck comes from the 1949 children’s book, Bartholomew and the Oobleck, by Dr. Seuss. In the story, King Derwin is bored with the four types of weather in his kingdom. So he tells his Royal Magicians that he wants something new to fall from the sky. Bartholomew begs him not to do it because he knows something bad will happen. But King Derwin doesn’t listen. Why does Oobleck behave the way it does? All fluids have a property known as viscosity that describes how the fluid flows – commonly thought of as how thick or thin a fluid is. For instance, honey is much more viscous than water. When a fluid’s viscosity is constant it is referred to as a Newtonian fluid. Oobleck is an example of a fluid whose viscosity is not constant, it changes depending on the stress or forces applied to it. If you poke it with your finger and apply a large force, it becomes very viscous and stays in place. If you gently pour it, applying little force, it will flow like water. This kind of fluid is called a dilatant material or a shear thickening fluid. It becomes more viscous when agitated or compressed. Ketchup could be called Anti-Oobleck since it becomes less viscous when agitated. Liquids like this are called thixotropic. Another non-Newtonian liquid is ketchup. Ketchup behaves in just the opposite way from oobleck. It becomes less viscous when agitated. Liquids like this are called thixotropic. If you leave a bottle of Ketchup on a shelf, it becomes thicker or more viscous. Nearly everyone has experienced this while trying to pour the liquid from a new bottle – it refuses to move. If you shake the bottle or stir it up it becomes less viscous and pours easily. 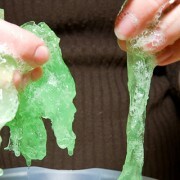 The first thing you have to do is simply place your hands into the Oobleck and start squeezing it. Have some fun! Try to make a ball by moving it around quickly in your palms. Once you stop applying pressure to the mixture it will flow out of your hands like a liquid. Try filling a pie plate with a think layer of Oobleck and then slapping the surface with your open hand. Because of the dilatant properties, becoming more viscous when a force is applied, the liquid will all stay in the plate. 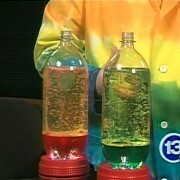 Try the same experiment with water and compare the results! If you have a lot of cornstarch and a small pool (or a large one like in the video) you can supersize this experiment. Since the liquid becomes more viscous when pressure is applied you can actually walk or run on the surface without sinking. Of course, once you stop moving you will begin slowly sinking into the liquid. Another fun experiment is to fill the cone of a speaker with some Oobleck. Connect the speaker to a low frequency sound source and watch as the Oobleck seems to come alive. Typically low frequencies get the fluid up and moving better than higher pitched sounds. A plastic subwoofer works the best, or you can use a sheet of plastic wrap to protect a paper cone speaker. To mix up some Oobleck grab a box of cornstarch, some water and a mixing bowl. In general, a mixture of about 1.5 cups of cornstarch to 1 cup of water is a good starting point. You will have to tweak these amounts to get the perfect mixture. Keep in mind that the mixing process can get messy so be prepared to clean up. Pour the cornstarch into a large mixing bowl and slowly add the water. You are shooting for a mixture that feels kind of like honey and tears a bit when you run your hands across the top. 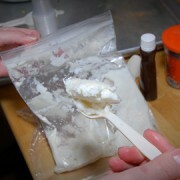 You will have to experiment with more or less cornstarch or water until you get the right mixture. If you want to color your Oobleck add some tempera paint. You can use food coloring if that’s all you have on hand. Food coloring tends to stain more than the paint, especially if you have a spill while preparing your Oobleck. One thing to keep in mind is that Oobleck is a suspension, not a solution. The cornstarch does not dissolve in the water like salt or sugar would. Instead, the tiny starch particles are suspended in the liquid. If you let it sit long enough in a glass, the cornstarch will settle to the bottom leaving a layer of clear water on the top. This is why it is very important to not pour Oobleck down the drain. Should the suspension separate in your drain pipes, you will be left with a hard clump of cornstarch that will block the drain. hey i did this in 1st grade, it was asweome!!!! i cont wait to do it again!!!!! did this at school with other recipe. can’t wait to do it at home! YEEHAH!!!!!! this stuff is totally cool it is so exotic but fun at the same time!!!!!!!!!!!! can’t wait to make this stuff but i have to go to a b-ball game. I guess Newton wasn’t that smart. This stuff is great especially with my pre-kindergarteners. They just don’t understand how it works! We did it after reading the story. HEYY EVERYONE OOBLECK IS AWESOME I MADE IT THIS YEAR IN 6TH GRADE AND I LOVE IT!!!!!!!!!!!!!!!!!! i did this in class today i cant wait to mak it! Oobleck is an awesome way to teach chemistry at the child’s level! I love Science!!! I can’t wait to make this stuff. It looks and sounds awesome. today i played with oobleck it was so cool and fun if you did not try it you should!trust me! Hey…I just made Oobleck at school!! at first i thought it was GROSS…but then i thought it was AWESOME!! Hi my name is morgan i made Oobleck in 2 and 3 both times wer fun the firt time my Oobleck was green the sekin time i mist bluw e and green and red and it ternd green ish graye ish thank you for lisning. i made oobleck last year in sixth grade and again this year in seventh grade!!!! i looooooooovvvvvvvvvveeeeeeeeee oobleck!!!!!!!!!!!!!!!!!!!!!!!!!!!!! I cant wait to make this my friend made this last year and it was so cool !! i touched it and my hand sunk in then i hit it with a hammer and It was like a rock!! my mom let’s me make it. I made oobleck in third grade and in fourth grade. This is very amazing. it is wiered how it does that. But it made me want to do some og thease at home!! I tried it at school today as a science expierement!!!!!!!! !